A portrait of Queen Elizabeth II by Stephen Lund and his bicycle in Victoria, BC. All told, this likeness of Her Majesty required more than 85 kilometres of cycling. A GPS portrait of Her Majesty Queen Elizabeth the Second. Doodled by a loyal subject and citizen of the Commonwealth. On a bicycle built in the Commonwealth realms. In a city named for her great-great-grandmother, Queen Victoria of the United Kingdom. And if that weren’t enough, I used Queens Avenue, Empress Avenue, Princess Avenue and Empire Street to sketch Her Majesty’s eyes and mouth. Perhaps, Your Majesty, you might consider commissioning a GPS doodle, by me, for your next official portrait. 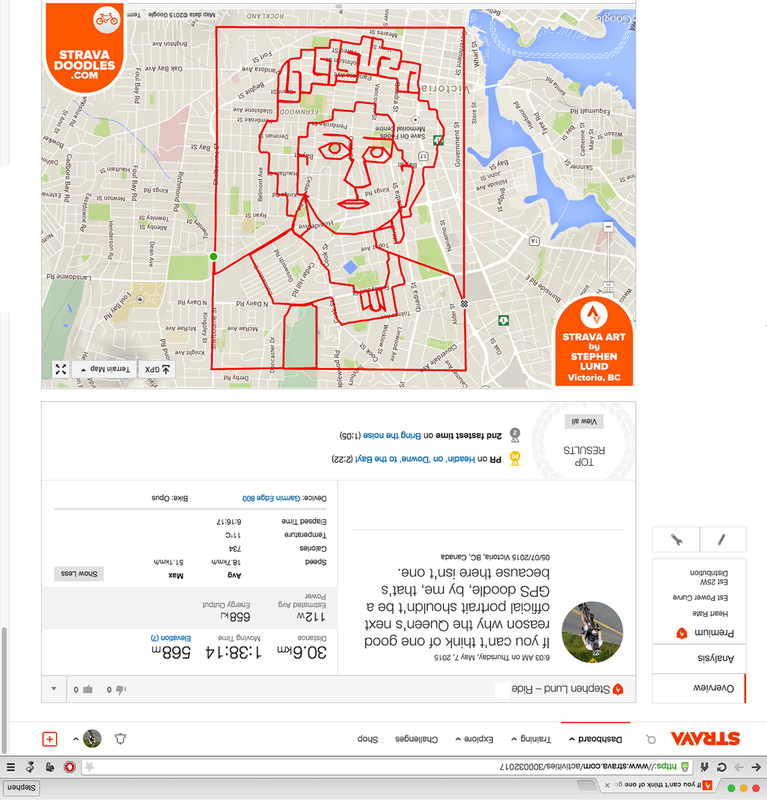 This entry was posted in gps art and tagged bicycle, bicycling, Commonwealth, creativity, cycling, cyclist, garmin, gps, gps art, Her Majesty, portrait, Queen Elizabeth II, royalty, strava, strava art, The Queen, victoria bc. Bookmark the permalink. How did you get the straight lines of the border? It’s just a matter of “connecting the dots”. When you stop your Garmin at point A, cycle to point B and then start it again, it connects A and B with a straight line. The mileage doesn’t get recorded as part of the ride, but it’s a handy trick when you’re Strava-doodling!